Port city Macau at night. • The Ruins of St Paul’s are the enduring symbol of old Macau and its Portuguese heritage amongst the hyper-development. Built in the 17th century, it was destroyed by fire in 1835. • Senado Square is the heart of the island, surrounded by historic buildings and paved in traditional Portuguese style, where people come to celebrate and be seen. • No trip to Macau, however fleeting, is complete without sampling a Portuguese Tart, or pastel de nata; buy one at Lord Stow’s (lordstow.com) and munch it along the way. • Resplendant with Chinese architecture, A-Ma Temple dates way back to 1488 and is dedicated to the seafarers’ goddess Matsu. 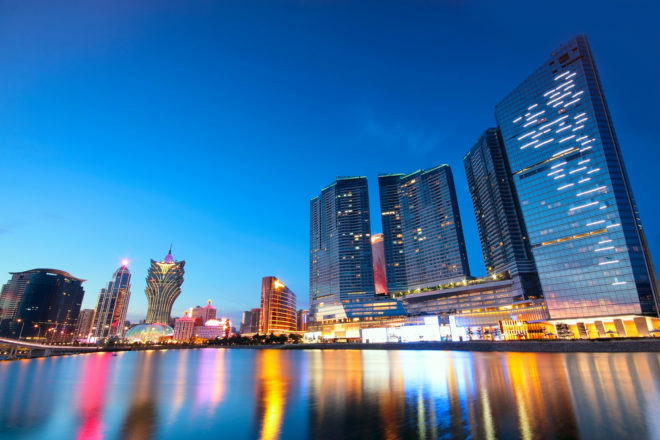 • Macau Tower dominates the skyline, and from the indoor observation deck you can take in the island itself, the Pearl River Delta and even Hong Kong on a clear day; or perhaps bungee jumping from the outside deck with AJ Hackett, if that’s more your thing.